Synopsis: Twelve-year-old villain, Artemis Fowl, is the most ingenious criminal mastermind in history. His bold and daring plan is to hold a leprechaun to ransom. But he's taking on more than he bargained for when he kidnaps Captain Holly Short of the LEPrecon (Lower Elements Police Reconnaissance Unit). For a start, leprechaun technology is more advanced than our own. Add to that the fact that Holly is a true heroine and that her senior officer Commander Root will stop at nothing to get her back and you've got the mother of all sieges brewing! 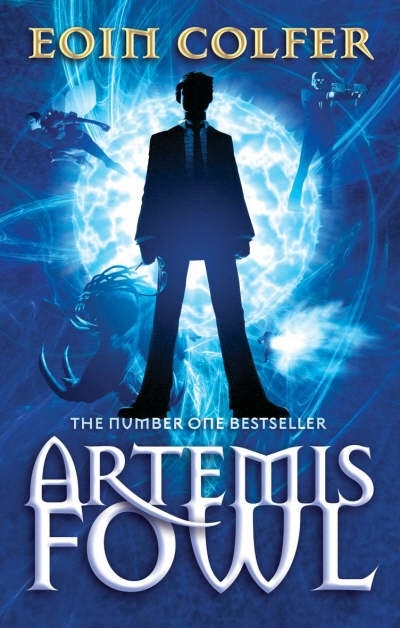 You might have guessed that Artemis Fowl is in the fantasy genre- it’s not exactly hard, but even though we are absolutely drowned in teen-fantasy novels, this one really does stand out. It has contributed greatly to the genre as a whole, and completely reshaped my idea of Fairies, something that is very hard to do. Another thing that really makes this stand out from other fantasy, is that it’s got a completely reversed protagonist. Instead of the overly clichéd good vs bad, we have have a book from the point of view of the bad guy; one that actually makes you side with him. You can’t really say that Artemis is the Hero archetype. The tone of the book, at least to begin with, is quite dark and secretive, all though one of the later theme that Colfer manages to hit on the head perfectly is the idea of change. A lot of the book shows an inner conflict within Artemis, the beginning of a change that the whole series is based on- to an extent. Religious philosophy doesn’t really make an appearance in this book; and there’s no real need to.The characters are very lovable and clever, especially Root, Foaly, Holly, and of course the deceptive and witty Artemis Fowl. All of them have got very unique style of speech within the novel, as well as very different personalities and characteristics. Colfer is very successful in his otherworldly characters, making them very believable and unique in a way that many authors have not managed. I find that Colfer has a very enjoyable writing style; he doesn’t bog you down with details upon details, and he doesn’t under-describe things. I think this is one of the selling points of Colfer’s books- his ability to keep you interested and yet be able to describe without boring, and especially in the current climate where many of us find it hard to drag ourselves through pages and pages of plain description that really isn’t relevant to the plot. The plot, too, is very believable, and unique. The mix of otherworldly characters and technology really does for a good book, and I found that I didn’t get bored throughout the whole book. This mixture of fantasy and sci-fi hasn’t been done like this before, and it certainly doesn’t come up to this standard of writing. Artemis Fowl is original, and Colfer manages perfectly to combined humor with fast pace action, in a way that is uncompromising for both. I would highly recommend reading Artemis Fowl; it is a timeless novel that I’m sure even adults will enjoy.